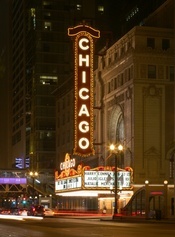 Chicago Theatre: The history of and a short guide to experiencing it. I was first intrigued to write a paper about the Chicago theatre when I was told it was one of the biggest theatre cities in the world. I used to live in the suburbs of Chicago but never really got downtown very often. I honestly had no clue just how big and diverse the theatre scene is in Chicago. You can literally see a different event every week for the rest of your life. Not many cities can make that claim and back it up. I would like to first start with the famous Chicago Theatre. It was first opened in 1921 and was often referred to as "The wonder Theatre of the World". The Chicago Theatre was the first lavish movie complex in America and quickly became the prototype for all others to follow. It was built in a grandiose French Baroque style and even has a mini Arc de Triomphe above its marquee. The grand lobby is modeled after Versailles and is 5 stories high with balcony levels patterned after the Paris Opera House. The Chicago Theatre has hosted the best in live entertainment and film with such stars as, John Phillip Sousa, Duke Ellington, Jack Benny, and Frank Sinatra. Unfortunately, it was "modernized" in the late 50's when stage shows were mostly discontinued. By the 70's it had become the victim of poor economics and was shut down in 1985. It has since been renovated and reopened and has hosted the world's biggest stars in live comedy and drama. Robin Williams did a comedy stand up in the Chicago Theatre that would have been fantastic to see in its 3600 seat hall. WriteWork contributors. "Chicago Theatre: The history of and a short guide to experiencing it." WriteWork.com. WriteWork.com, 14 March, 2006. Web. 21 Apr. 2019.